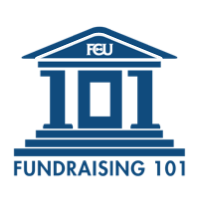 Studies continue to show that online giving is the fastest growing fundraising channel. But not every nonprofit is experiencing this stellar growth. So what's the best way to grow online donations? A firm called Dunham+Company recently released a study that has counterintuitive results. The study says direct mail is a growing source for online gifts. In fact, it says more than times as many donors say they gave online because of being prompted by a letter than by an email. You may think you have an easy online giving form. But it probably isn't as good as you think. Today, make an online gift to your nonprofit and pay attention to how it "feels" to go through the process. Also, take note of any confusing parts in the process. We are now in the most generous season of the year. People are already making end-of-year gifts. Do your best to make that process as easy as possible. And a simple online giving option is about the easiest there is! 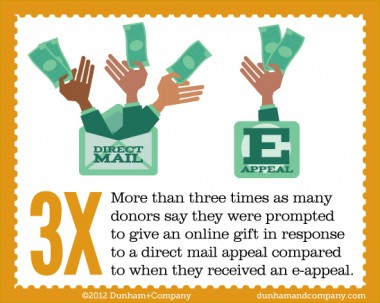 What are you doing to improve your online giving? In the comments, let us know what you're doing to improve your online giving. One of the organisations I'm working with are considering using a QR code in their year end appeal to make it even easier for donors to go from mail to online (this would be in addition to using the URL in the letter too). I'd be interested to know if anyone has done similar and if so, what results they got from this. Making a donation through your own pages is good advice and a great way to figure out how easy it is for people to give to your organisation. It always surprises me that so few organisations do this and effectively let the donor test their pages for the first time. I haven't tried the QR code, Heather, but I'll ask others if they have! My colleague and friend Blase Ciabaton who can be found at http://www.thedirectmailman.com or on Twitter as @TheDMailMan has experience helping nonprofits use QR codes. He's got a print business and a blog to check out. Visit his website and type QR codes into the search field. He wrote a post awhile back with information about a campaign that did well using the codes. OR contact him directly and he can answer questions. Good luck to you, Heather. Do you (or anyone else) know if QR codes suppress or increase gifts? Typically, less options are better. More options seem to confuse people into inaction. I haven't seen any statistical studies but wonder if there are any out there. If you're going to use QR codes in direct mail, always put in small print where to get a QR reader..not everyone is sure of what to do with them. QR codes have been very effective for some of my clients. They can be used in email signatures, on business cards (always good to make use of the back as well as the front of the card), on holiday cards or as part of a coupon/offer (link to a money off voucher/url). You can also use them in printed newsletters and on t-shirts if your manning a stand at an exhibition (great talking point)..
.. but always be careful .. check that they work, check that they link to where you want them to link to and always offer additional means of connectivity for those who don't want to use them or don't know how to use them. I just had a person say the QR code he had on his card went to the firm's homepage but really should've been going to his own profile. Nonprofits will definitely want a QR code in a fundraising letter to go to the donation form! we use an inexpensive online fundraising solution http://www.raiseathon.ca My daughter's soccer team used them for a kick-a-thon. The year prior in paper pledges we raised $10,000...this year online we raised $42,000. We will never go back. No hidden fees...just one flat fee. Another suggestion for the use of QR Codes within an appeal - use them to continue the "story" online thru a video. The QR code links them to your website where the video is embedded (also good for SEO). Or, include a video testimonial from a loyal donor. The strength of print is to drive people online - whether to donate, or to learn more about your organization. Rick, I like that VERY much! What a great idea! Another rather late addition to this conversation, but just happened to catch a link to it thanks to Barbara. I wanted to share some results from a survey we did recently. We were involved in about 30 different year-end appeals for our clients, and every year I do a survey of the results. To date, 93% of all money raised was through the mail. This leaves 7% from online giving, and you have to figure that at least half of this was prompted by what they received in the mail. I am a big proponent of doing "cross-media" marketing or solicitations, but none the less for fundraising the dominant revenue source is still mail.